There is a dangerous precedent being set right now, and it all stems from the act of being offended and the actions one takes to prevent future ‘offenses’. Many of those complicit in the quelling of free speech are merely useful idiots and have no idea they are participating in one of the most effective forms of censorship humanity has ever seen. All people have to do to silence anyone with whom they disagree is to now claim their speech offended or scared them. This speech no longer needs to actually be hateful and, as a recent case proves, it can be a dictionary definition of a word. 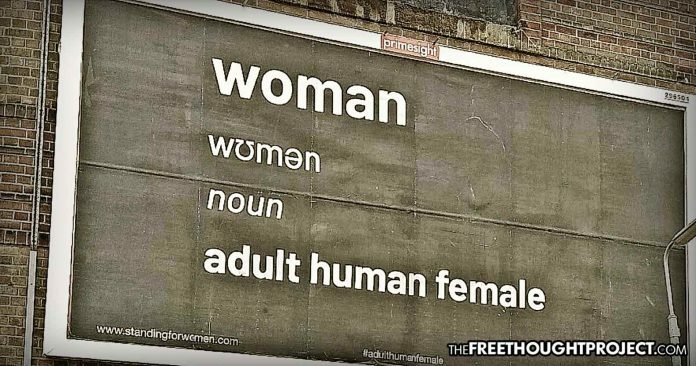 Case in point: a billboard in Liverpool that quoted the dictionary definition of “woman” has been removed after it was deemed transphobic hate speech. Feminist Kellie-Jay Keen-Minshull, founder of the women’s rights group Standing for Women, was behind the billboard campaign. Keen-Minshull is worried that women are under attack from trans groups who seek to redefine the biological definition of woman. So, she launched a campaign to simply inform people of the definition. Whether or not you agree with Keen-Minshull’s point of view is entirely irrelevant here. But logic appears to no longer apply when it comes to those being offended by the speech of others and so the dictionary definition of a word has now been cast into the endless pit of reasons to silence others. The billboard campaign barely lasted a week before it was taken down under pressure from Dr. Adrian Harrop, a Twitter activist and NHS doctor, who complained that it made transgender people feel unsafe. In response to the removal of her sign, Keen-Minshull told a British television morning show, that she fears we’re losing the word ‘woman.’ Indeed, it does appear to be under attack. “We might be called ‘cervix havers’ or ‘menstruaters’, in cervical cancer campaign material the word ‘woman’ doesn’t appear…” she said. “What you and your misogynistic allies are seeking to do is to erase what it means to be a woman, in law and in life,” she said. “And that is why this campaign has been absolutely essential. Even if you do not agree with Keen-Minshull, she has every right to do what she’s doing without being silenced. When the dictionary definition of a word can be considered “hate speech” and is removed as a result, the very fabric of freedom is withering away. Just like transgender people can use any pronouns they wish to describe themselves, a woman can post a definition of the word woman. If transgenders were facing similar attacks by transphobics—as in being censored and silenced—rest assured that TFTP would be speaking out against this as well. Telling people what words they can and can’t say to ‘protect’ others is chilling and nothing short of tyrannical. Freedom of speech does not come with terms and conditions as words alone, less the obvious yelling “fire” in a movie theater, cannot cause physical harm. The act of being offended is a choice taken by those who hear certain words. Limiting or changing language through political correctness does nothing to stop someone from offending in another manner or being offended. Political correctness is intolerance. While it is described as tolerance and presents itself as fairness, it restricts, controls, and censors entirely peaceful language. We would do well not to embark down such a dark path. Remember, a government and society crude enough to silence your critics is also big enough to one day silence you.